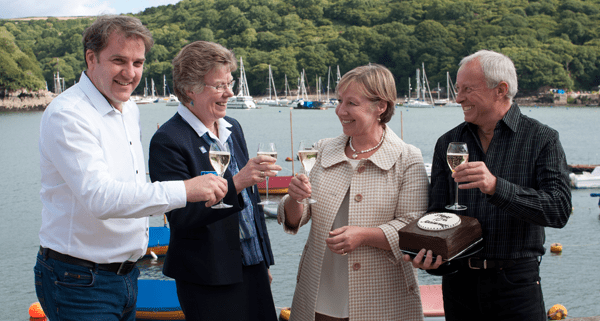 On 26th September 2013, it will be ten years since the Old Quay House Hotel, Fowey’s award-winning harbour front boutique hotel, opened its doors to welcome the first paying guests. Transformed by owners Jane and Roy Carson from a derelict B&B into an intimate, boutique hotel with a popular restaurant overlooking the estuary, The Old Quay House has become a firm favourite with visitors to Fowey seeking a romantic hideaway. Excellent service and attention to detail are coupled with a welcoming, relaxed atmosphere and dreamy views across the water to create peaceful retreat that is popular throughout the year. The hotel has scooped numerous accolades over the years including a restaurant ‘Remy’ and inclusion in the Good Food Guide, as well as being named Visit Cornwall’s ‘Hotel of the Year’ and, most recently, the Good Hotel Guide’s ‘Cornish Hotel of the Year 2013’.